You may be surprise to learn that virtually your entire body is covered with hair. Because most of the hair is fine and pale, it usually isn’t visible to the naked eye. 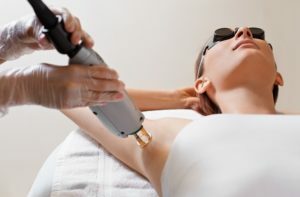 But when darker coarser hair appears in places which may make you uncomfortable – like on the face, neck, abdomen, breasts, legs or underarm in women or in the shoulder, chest and back in men, it may be time to consider hair removal. In the past the usual remedies for unwanted hair included plucking, shaving, waxing or chemical depilatories. Some are painful, some are messy and all are only temporary. Electrolysis is a popular and effective, but it is a time consuming procedure, which can be painful and is useful only in removing hair in small areas. During electrolysis an electric current passes through a needle to destroy each individual hair root. It typically takes months and numerous regular visits to clear even small areas. Laser removal is a more effective solution. It is the state of the art system specially designed to remove unwanted hair faster, with less discomfort and than other method. The length of a laser treatment may last anywhere from a few minutes to an hour or more, depending on the size of the areas being treated. Latest Technology With Proven Result. US FDA-cleared for all skin types.